Keep your child entertained this summer with simple and budget-friendly arts and crafts projects. 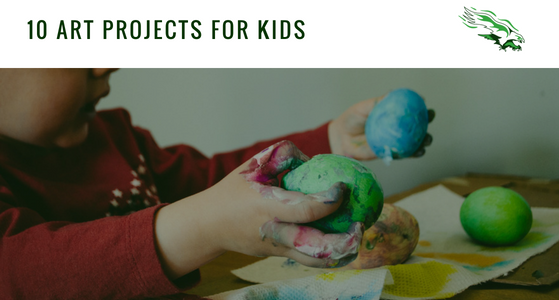 Here are 10 art projects for kids that allow them to play with materials, colors and structure. Let your little one experiment with expressing themselves through art and letting their inner Picasso shine. Start saving your soda bottles and toilet paper rolls! Once you’ve gathered up a large collection of recycled items such as cans, toilet paper or paper towel rolls, egg cartons, soda bottles, straws, milk jugs, glass jars, paper or plastic plates, styrofoam containers, or cardboard boxes, your child can start constructing! Give your child safety scissors and glue and have them build a mini city in the living room. Boxes can be made into buildings with doors that open and close, straws can be transformed into streetlights and toilet paper rolls can be converted into benches. Help your child with ideas but let his or her imagination run wild! Encourage your child to head outdoors and gather up some natural items from your yard. Your kid can glue stones, flowers, sticks, grass, dirt, or leaves on paper to create a work of art. Make it an educational experience by going to the public library and helping your child look up the leaves and flowers that they found in a book. Take it one step further and have them label each item on their paper. Your child’s art project has now turned into a research project! Use uncooked pasta and string, rubber bands or yarn to make a necklace, bracelet or anklet. Macaroni, penne noodles, rigatoni or shaped pasta with holes are the best for jewelry making. No canvas needed- your child can paint just about anything! Your kid can paint on paper or any recycled material such as paper or plastic plates. Don’t have a paint brush? Don’t worry, finger painting is more fun anyways! Let your child have some fun with their handprints and footprints. Make sure to do this activity outside or in the kitchen with newspaper underneath as it tends to get messy! Playdoh is a good investment as little hands can use it over and over again. Making a play dough from scratch can be a fun family activity and if that goes well, try your hand at making your own slime that your kids can play with for hours and hours. Let your child use safety scissors to cut paper strips and glue them together to make a paper chain. Use construction paper or be thrifty and use magazines or other recyclable paper. Let your child hang it up in their room when it’s finished or just simply see how long he or she can make it before it’s time for dinner. For a bonus educational component, have your kid count the rings aloud to practice their numbers. Use wood craft sticks and glue to build a house or get creative and make a robot, a flower or the letters of their name. For added color, use markers or paint for decoration. It’s summertime so save those popsicle sticks- they work just as well! Give your child a pencil and paper to draw their school, favorite animal or family. Crayons, markers and colored pencils can give their artwork an added creative step. Try coloring books for more direction or experiment with sidewalk chalk. If you want to expand the summer activity, make your own sidewalk paint. Start a friendly competition between your child’s siblings or friends and let them experiment with folding paper into paper airplanes. Give them time to play with different folds and then set the timer as they construct their planes. You be the judge and see which airplane goes the farthest! Take it further and make it a teachable moment about science and aerodynamics. Let your child make a card for auntie’s birthday, for dad on Father’s Day, or just to tell grandma how much she’s loved. Any craft project can turn into a thoughtful present for someone in the family! This can teach your kid that a gift is not about the monetary value but about the sentiment behind it. An art project is the perfect way to spend a summer day. Your child will learn something new and build their creative capacities and you have time to make dinner or fold the laundry without a bored child at your side. You might even end up with something to hang on the refrigerator!